Over Haddon is one of the prettiest villages in Derbyshire just 2 miles south west of Bakewell. This small village is built mainly of limestone typical of the White Peak District and stands on a ridge high above Lathkill Dale. The village houses only one pub the Lathkill Hotel, formerly the Miners Arms, which has beautiful views of Lathkill Dale and can be seen for miles with its whitewashed walls. In one of the nearby fields once stood Over Haddon Hall built in the mid 16th century and demolished before the invention of cameras so only a few drawings are said to exist. There are remains of an old corn mill dating back to 1529 and was still working in the early 19th century and also on this site a mill is known to have existed in medieval times. Further upstream of the mill are the remains of lead mines and also the bob wall of Mandale Mine and the derelict remains of Bateman’s House. There are also the remains of a tiny pump house which once held equipment that fed troughs in the villages of Over Haddon high on the hillside. In 1854 a small quantity of gold was found and this led to a gold rush but after a short while the gold was analysed as “fools gold” and the mine soon closed. 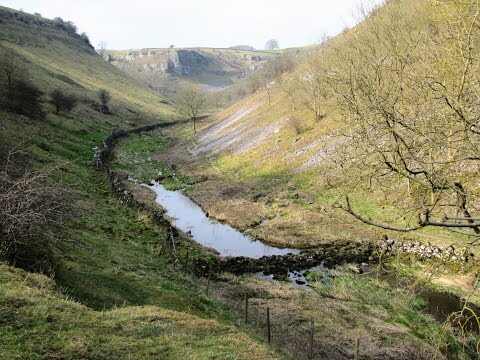 Lathkill Dale is one of the finest valleys of the limestone dales and the upper part is a National Nature Reserve, in the care of English Nature. The River Lathkill is a disappearing river, when in summer or after long spells of dry weather the river follows an underground route and appears from a series of swallet holes downstream. The river is one of the smallest rivers in Derbyshire and is one of the prettiest with so much character of any river we have ever seen, it has a series of eleven weirs and the deepest one is known as The Blue Waters due to its colour. The upper part of the river is a Site of Special Scientific Interest and a candidate of the Special Area of Conservation under the European Union Habitats Directive. Youlgrave is situated in Bradford Dale, on the ridge of the south facing hillside, and very close by are the villages of Bradford and Alport. Youlgrave is the largest with a few shops, butcher, a post office and three pubs the Farm Yard Inn, the Bull’s Head and the George Hotel and also a youth hostel and car park. In the summer Youlgrave is a busy attraction for visitors and walkers. The water tank in the village is known as The Fountain and in the 19th century was the water supply which was piped up from the River Bradford. The hamlet of Bradford on the outskirts of Youlgrave looks down onto the River Bradford where there is an abundance of ducks. Alport is a small, quiet and attractive village with stone houses dating back to the 17th and 18th centuries. There are no shops or pubs here but the walk along the River Bradford to Yougrave then on to Monyash through Lathkill Dale is a superb and very pretty 5 mile walk. Parts of the footpath from Conksbury Bridge along the River Lathkill and also from Alport along the River Bradford are suitable for wheelchair users. Before we start our walk we show you around the village and then start our walk from the car park in Over Haddon. From the car park, near the toilets, we turn right and follow the no through road steeply downhill, passing the disabled parking area, until we reach the bottom and into Lathkill Dale. We walk through the gate with two buildings on our left and follow the River Lathkill, also on our left, towards Monyash. Lathkill Dale is so beautiful you really do need to take you camera. As we walk we encounter lots of wildlife including ducks, cutes, moorhens, dippers and wrens, and we take a look at the old mines and shafts. We take a path off to the right to have a look at the bob wall of Mandale Mine and a little further on, over a foot bridge on the left, the remains of Bateman’s House. We carry on following the river until we come to a footbridge and a weir with Cales Dale going off to the left. Here we go over the bridge and walk up Cales Dale for a short way and then take the path on the left down the hill over a stile and then steeply up some steps to the top where we turn left onto the Limestone Way. We now follow the Limestone Way across the fields, through a farm and across some more fields until we reach the road and a car parking area. Here if you want to do a smaller walk turn left at the road until you come to a footpath sign on the left and that will take you back down to Over Haddon. But we take the small road opposite, Moor Lane, still on the Limestone Way. We go a short way and take the footpath on the right by the side of the pay and display car park. We follow the path until we come to a road here we turn left and take the footpath on the right through a wooded area to another road. Here we turn right and follow the road round a hairpin bend and take the footpath on the left. We now go downhill, still on the Limestone Way, to the River Bradford at the bottom. We turn left and follow the river on our left to a footbridge just below Youlgrave. We cross the footbridge and turn right through the gate and follow the river now on our right until we come to a small road and bridge. Here we go through the gate opposite and follow the footpath with the river on our right and then the path crosses the river so now keeping the river on our left we soon arrive at Alport. Here we cross over the road at the bridge and take the footpath opposite now with the River Laskill on our right. We follow the river to the road, look for the Mandarin Ducks that we saw on the right, then turn right and go over Conksbury Bridge, where there is a disabled parking area, and take the footpath on the left with the River Lathkill now on our left. The series of eleven waterfalls is beautiful and this is where we see the Goosanders. We then arrive back at the two buildings we passed at the start of the walk along Lathkill Dale and turn right back up the steep hill into Over Haddon. This is an easy to moderate walk with a few steep inclines and declines. Approx 9 miles using OS map The Peak District (White Peak Area) OL24. The shorter walk is approx 6 miles. Over Haddon is near Bakewell in the White Peak District of the Derbyshire Dales, Derbyshire. From Bakewell take the B5055 towards Monyash and take a left turn sign posted Over Haddon. There are public toilets in the car parks at Over Haddon and Youlgrave and also in Bakewell. For refreshments there is the Lathkill Hotel in Over Haddon and three pubs in Youlgrave, the George Hotel, the Farm Yard Inn and the Bulls Head and also few shops including a butcher, post office and gift shop. There are also plenty of shops and pubs in Bakewell. Thank you for your comments. As you can tell from the title i am a working taxi driver (based in York). All the walks on the website are done in my spare time and i try to put one new walk a week on to the site at great expense to myself in fuel and accommodation fees. I am sorry if we have missed any parts of the walk, which you obviously know well. 80% of the walks we do we walk blind off the OS map including the Over Haddon walk. What we are trying to do is give people a rough idea of a walk in a certain area and seen through our eyes. As you will see if you follow our website that we do walks in other counties aswell as Yorkshire. All the filming and comments i make are done in one day as we walk, i never know whats round the corner or what i am going to say. We then take the film home and edit it ready for the website. This is a totaly amature operation and on our write up we do give the number of the OS map that we use. We also if you look on our website try to advise where the disabled and wheelchair users can walk and enjoy the countryside the same as abled bodied. This is a very expensive hobby but we hope that if we encourage more people to get out into the countryside then its worth it. We would like to thank you very much too, for your interest and comments on the Over Hadden walk in the Peak District. We are pleased that you enjoyed watching our videos and hope that you will keep watching them, also as junior gets a bit older and stays awake I hope he will enjoy them too. We will be uploading two new ones on Thursday and in the following weeks walks in Ludlow, Malham Cove and Tarn, Ingleton Waterfalls and the Lake District. Simply love the information and vids you publish. We realise (unlike some!!) what effort is put into your hobby and believe me as part time walker the info is fantastic. Over haddon was stunning and the info you gave was the reason we went. We now follow many of your walks and love every minute. Thanks for the comment and yes it is hard work putting these videos and information together as we both work full time. We love doing these videos and encouragement from people such as yourselves spurs us on. We’ve just put together four videos in Hayfield and Edale in the Peak District which are the locations for the Sunday night series “The Village” and our first video will be on our site on Friday. This is a beautiful place and we loved every minute of it. The people in the area have been very helpful with us once they found out what we were trying to do. I just happened to drop on your site while searching for information about the local area. We, my family and I, are staying in Over Haddon, down from Leeds for a week. We took your advice and walked Lathkill Dale yesterday. I’m glad we did it was all you said it would be, and more. Your site is a mine of information about walks all over the country and I’ll be using it for sure whenever I need a pointer for walks. The tenor of the site is just right, and your obvious enthusiasm and genuine interest in what you see comes across and is a real inspiration to get out there. Thanks again for a cracking site. abbout my difficulty. You’re incredible! Thank you! В ней проверяется правильность всех ранее указанных данных.